Last week’s daily price action setup trades gave satisfactory results. One of the pairs did not perform as expected and was stopped out (GBP/NZD). While two others- GBP/USD and GBP/CAD gave very good results- especially GBP/CAD. 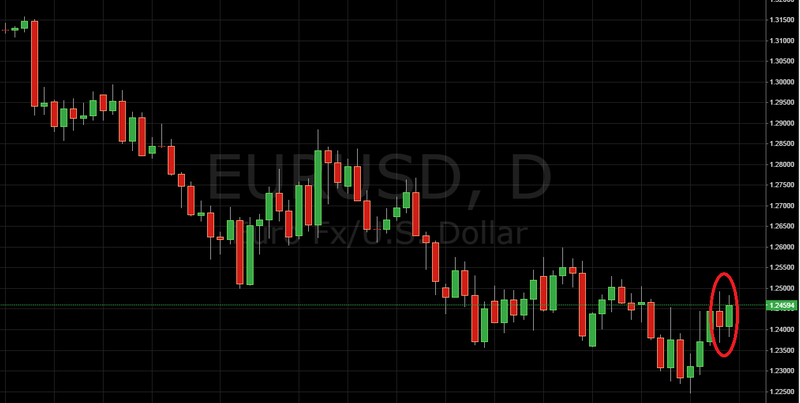 This week, I am looking at the most traded currency pair in the world– EUR/USD. It is showing some signs of a reversal. My personal belief is that trading against the trend is as safe as trying to catch a falling knife. From a daily price action setup point of view, this pair looks ready to make a minor correction or a major reversal. Looking at the daily price action picture, I can clearly see some a few signs of exhaustion of the downtrend. First of all, this pair has traded near the 1.2300 support level for quite a long time- more than a month. Secondly, I see a few rejections of the 1.2200 level and a couple of daily rejections of the 1.2300 level. Lastly, the daily price action setup that we have from Friday is a bullish engulfing pattern. This gives further confirmation that buyers are willing the test the next resistance level. That is why, depending on the Sunday open, I would like to go long on this pair. Entry at 1.2425 with a stop just under 1.2320 and a first target- the level of 1.2550. Depending on how the price reacts to this level, I will decide whether to let the position run to my next target at 1.2900 or take profits.